There’s something about a ramekin that melts me – I always associate them with Gu. It’s probably why I keep buying them 10 years after they launched – because of the amazing puddings in the keepsake ramekins. I have so many ramekins I decided to try and fine something to do with them and I have – chocolate chip cookies in a Go Puds ramekin! Preheat oven to 180C or 160C if you, like me, have a fan oven. 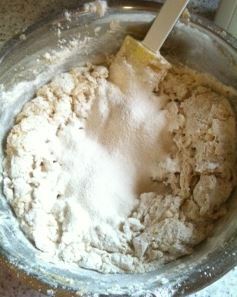 In a large bowl, beat the room-temperature butter and both the sugars together with an electric mixer until well mixed. It should look light and creamy – it’s sweet butter at this point. 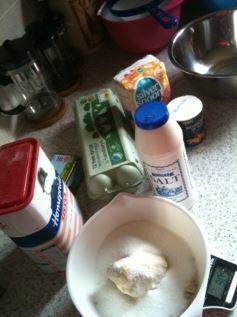 Next, beat the egg and vanilla into the sugar mix but carefully. The liquids will blend in easily but will sit on the surface at first so may splash! Lightly grease the ramekins. I used my leftover Gu pots. They are not necessarily oven safe so please DO NOT use these for freezing and putting into the oven – use proper ramekins. Fill ramekins about half way up with cookie dough because the dough will rise as we’ve used a raising agent (baking soda). Place ramekins on a baking tray and bake until tops are golden brown, 16 – 18 minutes, depending on size of ramekin. The cookies should be slightly undercooked for a gooey result, but not doughy. Remove from oven and eat immediately, with ice cream or let them cool slightly to eat without. 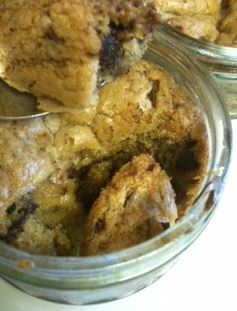 Freeze measured amounts of cookie dough for later – in ramekins if possible or ball them in 60g balls for a cookie that bakes in 16 – 18 minutes. 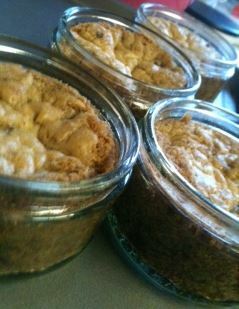 I’ve seen these done individually before so wondered how many ramekins this recipe makes?